Adventure bikes are one of my favorite categories of motorcycles. 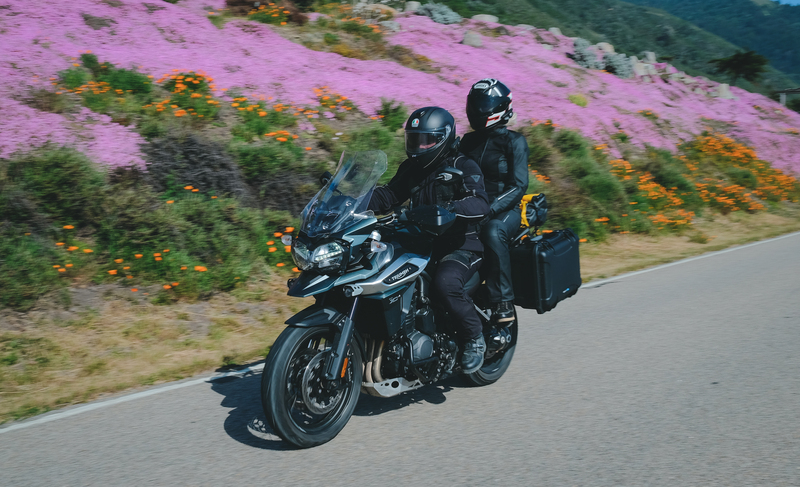 Ask me what I would take on a long trip given the choice between full-blown touring bikes, sport tourers, or ADVs, and it’ll be the adventure bike every time. I like to explore so the additional ground clearance and better equipped-suspension means that I don’t have to stop when the road does. With the big ADV bikes floating around 1200cc, they generally pack enough oomph to be a lot of fun on a canyon road while still delivering enough torque to chug along at low rpm off-road. 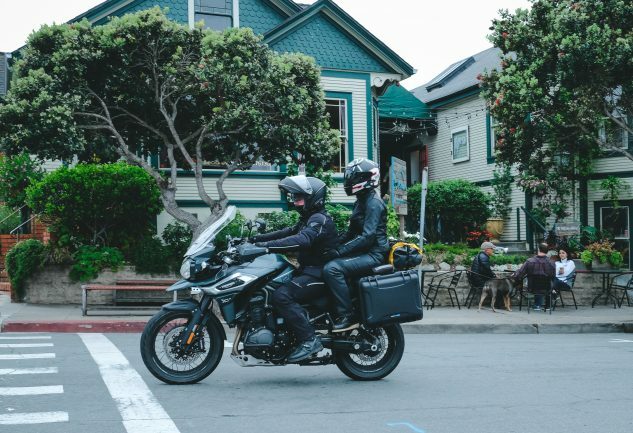 When I pitched a two-up ride to the Quail Motorcycle Gathering to Mr. Brasfield, I already knew which bike I would propose to take, the Triumph Tiger 1200 that had been floating around the garages of our staff for a couple of weeks. Full disclosure: I really like Triumphs. My first street motorcycle was a 2000 Triumph Speed Triple 955i, and more recently, I owned a newer version of the same bike, a 2012 Speed Triple 1050. I thoroughly enjoy the Triple engines that Triumph builds and love their characteristics. My first ride on the Tiger 800 XC almost landed one in my garage when I was searching for an adventure motorcycle of my own. Fast forward six years, and the latest and greatest of Triumph’s adventure line-up, the Tiger 1200 XCA, is basically the ultimate touring machine. All day comfy ergos, plenty of torquey power from the big Triple engine, a host of rider aiding electronics, and fit and finish that exudes quality. The only issue taking our press Tiger on a tour? OEM luggage for the 2018 model was not yet available. Thankfully, our friends at TwistedThrottle had just introduced its line of Dryspec H35 side/top cases which were available, and were sent to us to be used during our travel. Between my own Wolfman drybag and the Dryspec cases, we had more than enough storage for the three-day trip. The California state flower and Dryspec cases. What more could you ask for? Photo by Kiyoji Whitener. 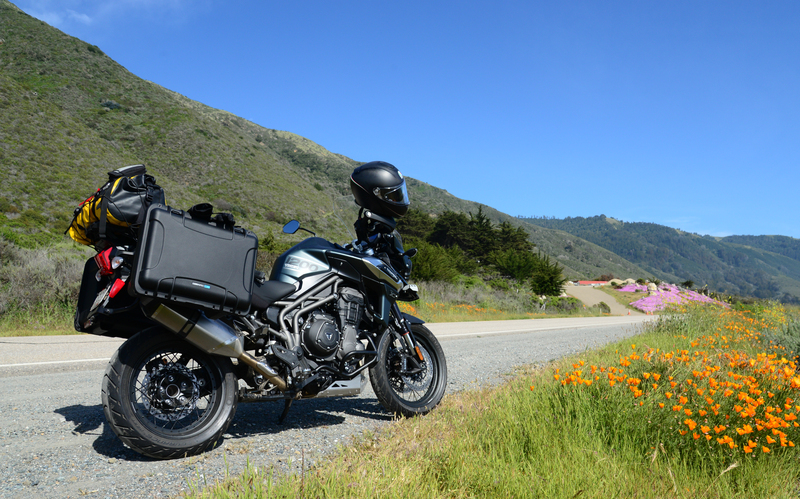 I was excited to get to know the 2018 Tiger 1200 a bit better over the course of a 900-mile, three day trip to the Monterey Peninsula with my wife on the back and two friends in tow. I had spent a fair amount of time bouncing around town on the Tiger plus a full day out on Jeep trails with the big kitty, but this would be the kind of test we all too rarely get to do because of time and resources. Our ride would include the four of us on two motorcycles making our way up to Monterey on Friday, checking out the Quail Motorcycle Gathering Saturday, and making our way back to the LA area on Sunday. 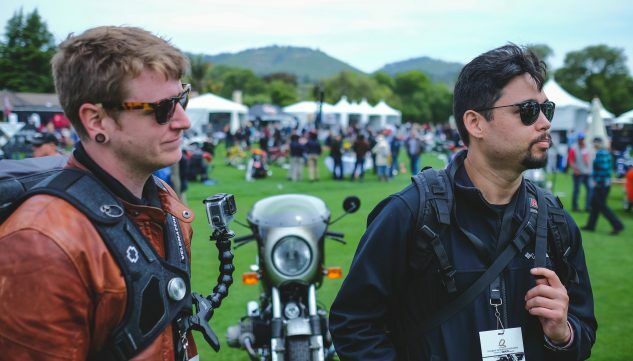 It would be the first time at the Quail Motorcycle Gathering for all of us, and we were stoked to attend the event. 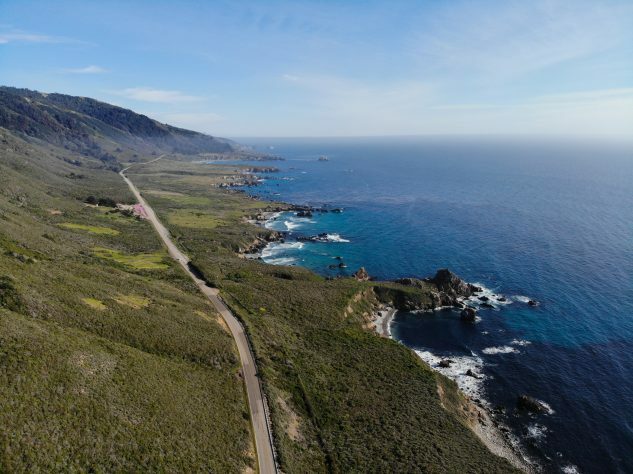 However, we were just as excited to enjoy some time in the saddle through the sinuous roads of California’s central valley and on to the always awe-inspiring central coast and Big Sur area of California’s shoreline. Other areas of trail weren’t so smooth, but those sections made it harder to park and take a picture. We used highway 101 North to displace some time that we hoped to use later on more entertaining stretches of tarmac, which we hoped were less traveled. The Tiger 1200 was a willing steed for gobbling up freeway miles. Cruise control set, suspension preferences set, for the early morning stretch the heated seats and grips were flipped on, and adjusting the electronic windscreen all the way up kept the wind off of both myself and my passenger. Dang! Who knew touring could be so comfortable? Blasting up the 101 and cutting over to the Pacific Coast Highway (north of the landslide that has yet to be cleared) via Nacimiento-Ferguson Road, I had hoped to see much less traffic on that one lane, somewhat narrow road. Unfortunately, now that Nacimiento is the only connector to the coast road in the area, it’s constantly busy on the weekend with folks who are driving too fast, don’t know the size of their own vehicle, or a combination of the two, making for a less than enjoyable cruise on the otherwise scenic route. It’s interesting how much more nervous I was in that scenario with my wife on the back than I would have been riding alone. Love does weird things. The Pacific Coast Highway will always be one of my favorite roads. Coming around the bend of Nacimiento road as you near the coast offers spectacular views of the Pacific Ocean and for now, a left turn onto PCH gives you an eight-mile or so stretch of road than doesn’t go anywhere so there is little traffic, allowing you to truly take in the beauty that surrounds you. After making our way north to the ocean-front accommodations we had secured, we Ubered to Cannery Row in Monterey for a nice dinner, at which we were joined by some friends who were also visiting for the Quail, before retiring early after the long day. No time to stop and smell the flowers. We’re working! Photo by Vineece Rosario. I thoroughly appreciated how easy to use the Dryspec cases were – but you can read more about that here. Taking the cases into the hotel in the evening and putting them back on before leaving for the Quail was a cinch. Only needing camera gear and whatnot at the Quail left the other case empty to store jackets and such. Having lockable storage is incredibly convenient. Kiyoji and I devising a plan on how to sneak out of the event with the Curtiss Warhawk. Photo by Vineece Rosario. Walking around the green at The Quail Lodge, ogling motorcycles, and chatting with industry friends was an unforgettable experience. The event brings out some of the rarest motorcycles in the world and a whole slew of interesting folks who own them. It’s easy to see why so many people I know opt to come back to check out the show year after year. On the hunt for a coffee roastery. Photo by Vineece Rosario. With my head still spinning from the sensory overload of unique machines, we left the concours and headed for the nearest coffee shop to sit and distill our thoughts and share photography and video. After a low-key dinner, we sat out on the rocks of Lover’s Point near our hotel as the sun sank into the Pacific ocean. 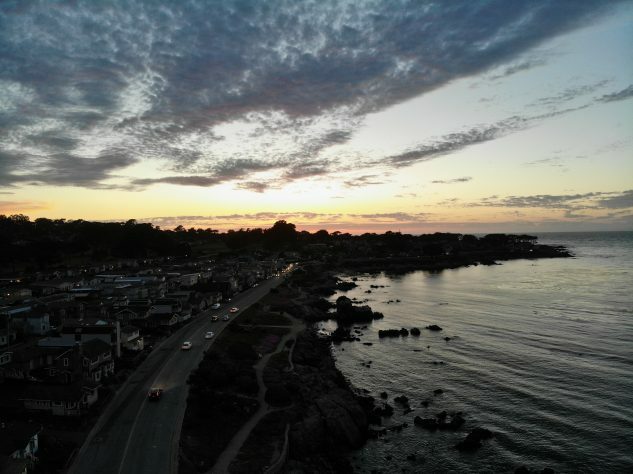 Although we still had a full day of riding the next day, we felt as if our journey was coming to an end since we would be leaving the Monterey Peninsula in our rearview mirrors. The sunset was particularly spectacular that evening, and we stayed until the fiery orange and red sky had turned to the deep blue of night. We had another fun route planned through Carmel Valley for the way home before connecting back to the 101 farther south. It seemed we weren’t the only folks looking for a fun ride after the Quail, and we happened to see many of the motorcycles that were on display while making our way east on Carmel Valley Road. During my time on the Triumph Tiger, I really came to appreciate all the comforts the machine offered in terms of tech, adjustability, and actual rider and passenger comfort. My wife, who doesn’t ride for long distances very often, praised the passenger comfort of the Tiger and thoroughly enjoyed the heated seat during the chilly mornings. I was constantly adjusting the suspension and windscreen to best suit conditions and using cruise on every long stretch of highway. 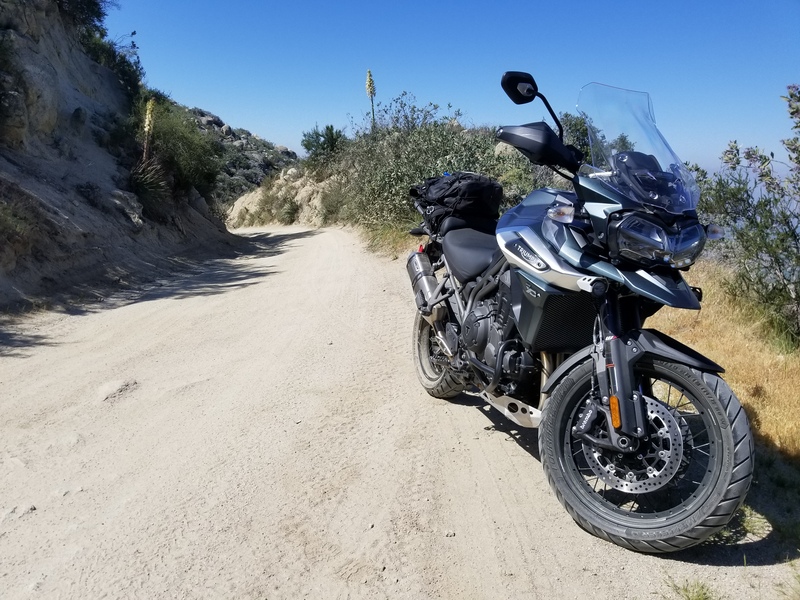 There were only two issues that I would ding the 2018 Triumph Tiger 1200 for. First, 5.3-gallons of gas isn’t much when considering the adventure market boasts bikes with nearly eight gallons of tank capacity. The gas light would come on around 165 miles, and although my calculated fuel mileage of 40 mpg projected that I had 212 miles per tank in range, I didn’t want to push my luck with my SO on the back. The other issue was heat, which was only noticeable while lane-splitting in and out of the hell that is LA traffic. When the fan was on and we were slowly making our way down the 101, the heat put off from the big Triple was felt from my knees to my chest. On a 90-degree day, after riding 400+ miles, it was fairly unpleasant. Thankfully, once up to 40 mph or more, I didn’t really notice it much. Even if your riding plans don’t include so much as a notion of riding on much more than a dirt or gravel driveway, adventure bikes continuously prove to be versatile machines that are just as adept on canyon roads and touring on highways as they are around town or down the trail. It’s not really a surprise that the segment is booming and we keep seeing manufacturers like Triumph dumping technology and research into these machines.